Hobbits have been living in the four Farthings of the Shire for many hundreds of years. Quite content to ignore and be ignored by the world of the big folk…..
Hobbits. Ya gotta love them. So we had a little barbecue last weekend. You know. The one where my Mother-in-Law made the ribs. That one. Yeah. So early the morning of the barbecue I go out to the pool to see how it looks and I notice the pool gates open. (Jude forgot to close and lock the gate. Good going son.) As I step up to the gate I notice that right in front of me there’s a raccoon drinking the pool water! Whoa! The raccoon turns and looks at me and says, “Ya got any saltines.” To which I replied, ‘What the heck are you doing out here during daylight hours!!!! Do you have rabies? ?” I then yelled something like hit the road. He turned and went into our cabana area. I figured if I left and came back in a couple of hours he would probably be gone. Of course I was wrong. Later on I yell at him again and he runs into our bathroom. (We have a bathroom out at the cabana.) This isn’t good. But it’s the fourth of July weekend and they’re selling fireworks for the first time in New York. Not good fireworks just the cheap stuff. I’m thinking I’ll get a smoke bomb and smoke him out of there. How’s he going to stay in a smoke filled room? Okay Jim, let’s not make this too long we’re all getting old here. Hold on there people there’s a moral to the story if you just bear with me. So I go to the dollar store and by 6 smoke bombs. They don’t call it the Dollar Store for nothing. I think I got the cheapest smoke bombs in the history of smoke bombs. More smoke came out of the match we used to light the smoke bomb than the smoke bomb itself!. We tossed all six in there. The raccoon was now in a deep sleep. So Jude says, “Let me go to the real fireworks place and get a smoke grenade.” So I said ok. He comes back with this grenade that looks like a real hand grenade. Now the Editor is worried. As usual. I mean we can’t have a barbecue out at the pool with a raccoon in the bathroom, right? Then he pulls the pin. Moral of the story: Read the instructions and don’t trust the dope behind the counter. Final outcome: I opened up one of the siding boards to the bathroom, locked the door and chased him out of the opening with a stick. He was glad to be gone I’m sure. Whew. Hello? Anybody still with me???? Is it Christmas? Oh yeah. Almost forgot. There was a problem with the website for quite some time as far as leaving comments is concerned. It’s fixed just to let you know. Hobbit houses. Yes, we now have water people. They put the system in on Friday. Check it out. 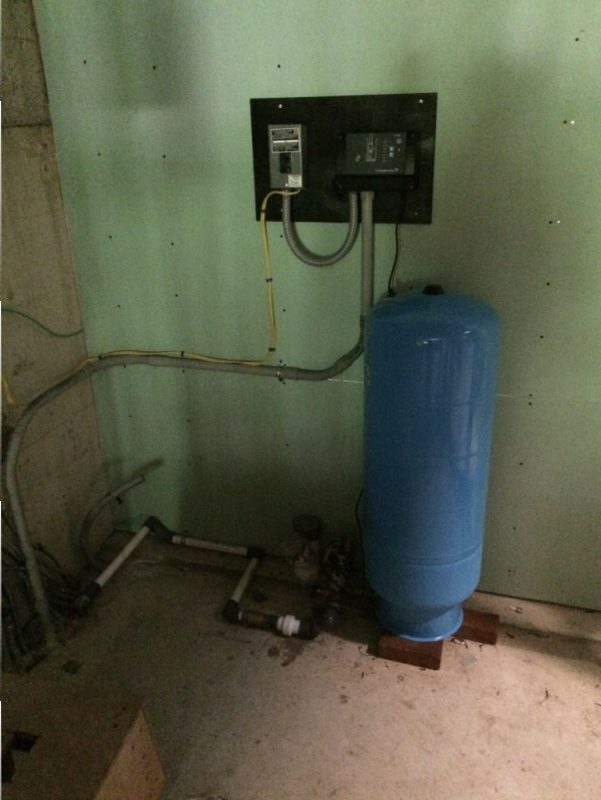 Constant water pressure system installed with tank. I have to hire a stone guy real soon. I might even put a temp bathroom in. The reason being I had “to go” so to speak and got to my Mother-in-Law’s house and could not get in. (She lives about two minutes from the Hobbit house) She changed the lock on me! Could you imagine? That led to a series of rash decisions that I’m not going to get into here. Not right now anyway. It involves breaking the speed limit in the Village of Pawling and sweating profusely if you’re interested.. But I’m not going to get into all that here. Like I said. Can you believe she had the nerve to change the lock on me????????????? Couple of other things to note. 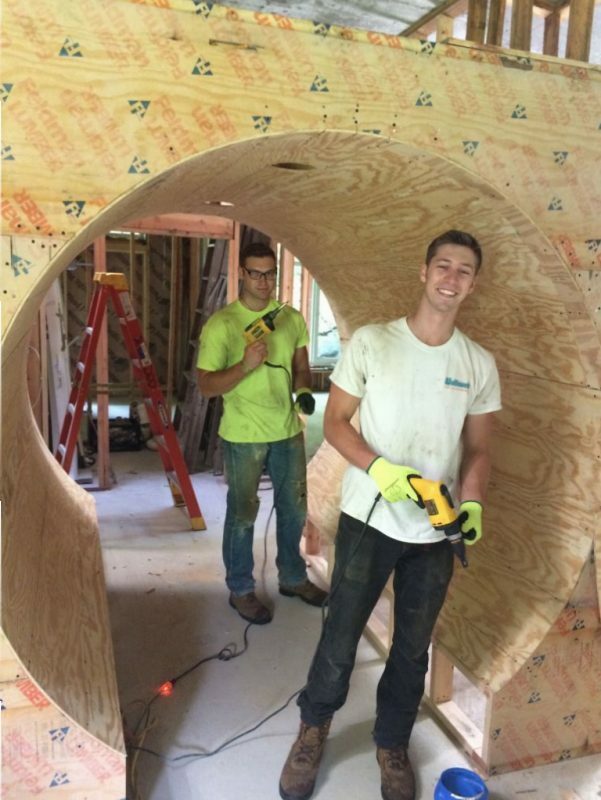 I started the second layer of plywood on the hallway. It was a little more difficult than the first layer because I needed to put the first sheet on centered over the center line of the hall. The men of Bree showed up to give me a hand. 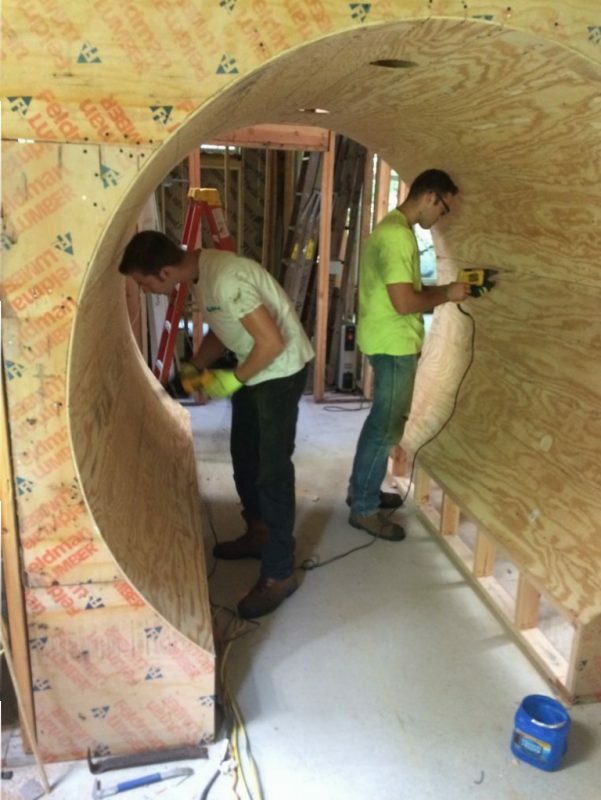 Second layer of plywood going on. Pretty cool. That’s all natural light in there. It’s pretty bright. I also did some air sealing cause I have a blower door test scheduled for Thursday. Hopefully that goes well. 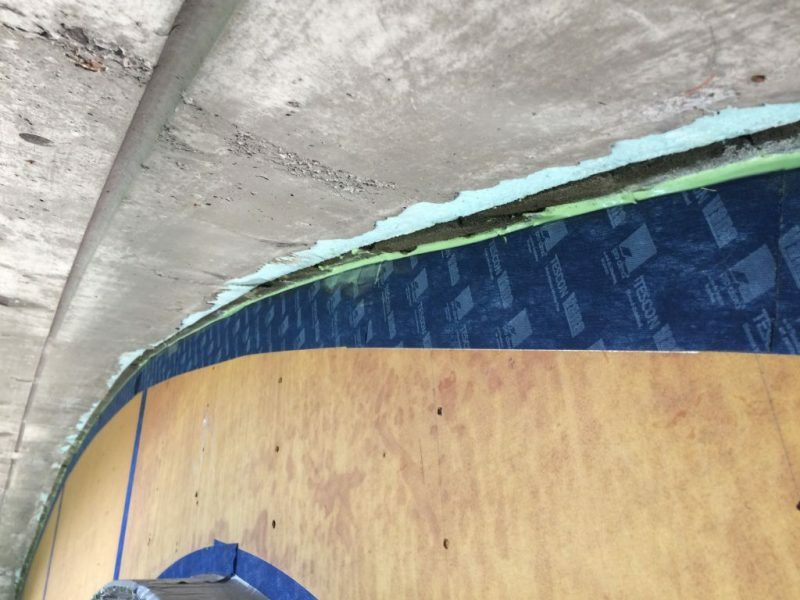 I air sealed the corners of the Hobbit house with a special sealant called Contega HF. 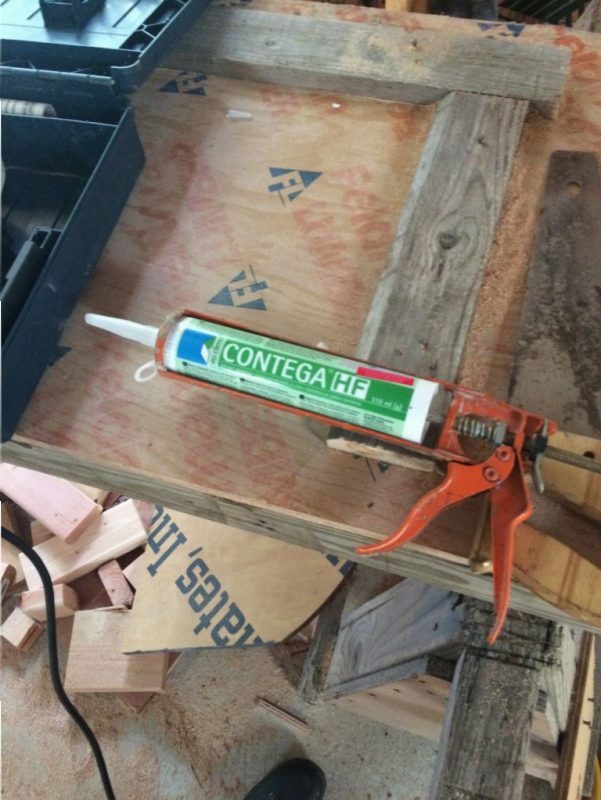 air sealant used for rough areas where you can’t use tape. You have to wear gloves when you use this stuff. And take your time. This is the one weak spot in my air sealing assembly. I’m not sure if this is going to do the trick. We’ll find out Thursday. Oh, check out this picture I took. It’s a little fuzzy cause the camera doesn’t do closeups that well. It’s a spider’s egg sack hatching with the baby spider’s coming out. 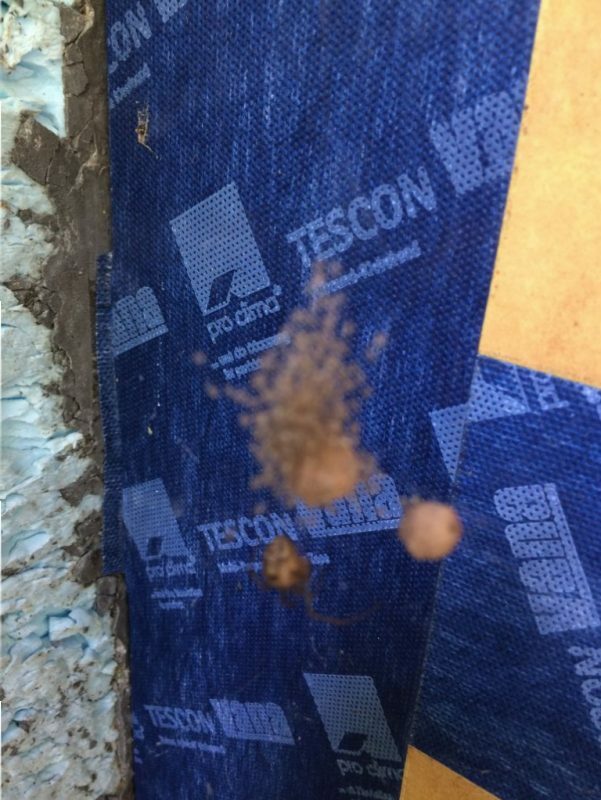 Baby spiders coming out of their egg sack. Yeah, it really is a lousy picture. Sorry about that. So the plan is to start the exterior door trim assembly next week. And possibly the exterior insulation! Have a great week and I hope you are enjoying the summer! A couple more photos for the road. Bird’s nest on top of the window. Pretty elaborate. I’ve never really seen a nest quite like this one before. Where’s Sally H. when we need her? 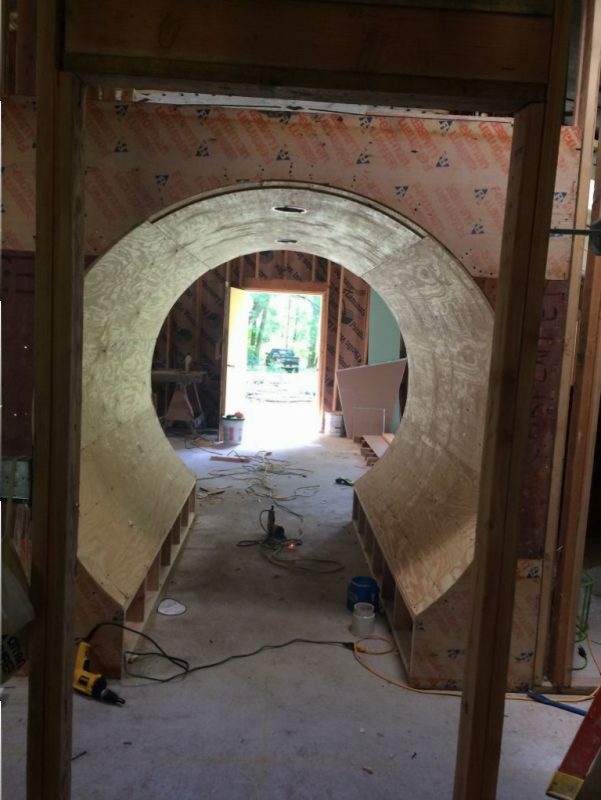 A Hobbit Hallway nearing completion. Hobbit Hallways Part 3…..Which Lobster is for Your Father????? Yeah, I’m not trusting a racoon who is not running from me. My husband is very concerned about humans being exposed to rabies (it can hide for a long time and present with vague or uncharacteristic symptoms, and it is preventable but not cureable) so every animal under our care gets a rabies shot every year. I would do my best to kill that racoon – for everyone’s safety. Don’t they sell varmint rifles where you live? 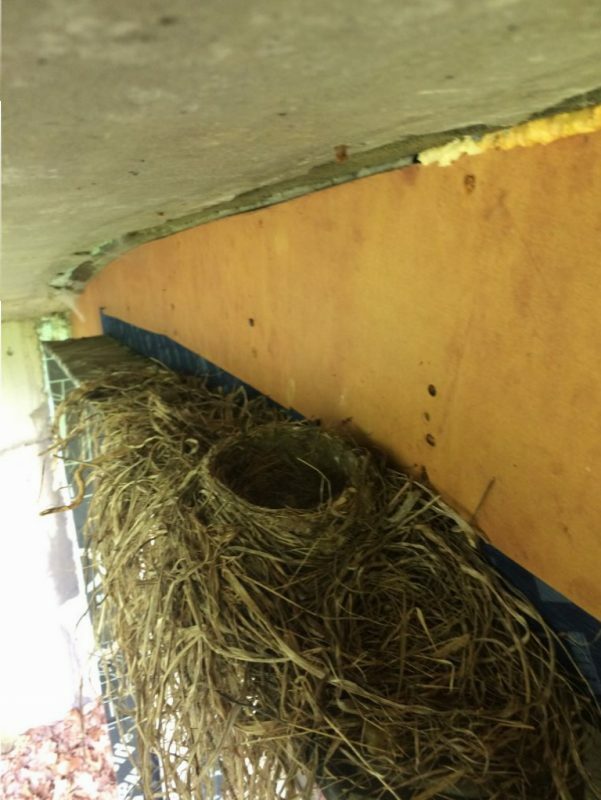 That nest could belong to a number of different altricial bird species including pheobes and robins. Hi Sally! How’s your summer going? The racoon, in my opinion, must have been disoriented from something. Not sure what. He/she seemed to want to be left alone to sleep more than anything else. I have seen rabid racoons and they were shot in those cases. But yeah. Rabies is not to be taken lightly….and it’s New York. You can get anything you want in this town. But I’m not a gun guy. I hope all is well…wasn’t really thinking robin. Interesting. I bidn’t change the lock,it just needs a little wd40 oil on it so get moving,it gets stuck,if a little old lady almost 80years old can open it with a little pushing I’m sure a big strong guy like you can do it,there’s a can of that oil in the basement use it please. I’ll say it again those boys are good looking,well the darling Georgia Lee will be home today can’t wait to see her which means you’ll be seeing more of me. Dear Mother-in-Law: You can say whatever you want about the door in the comments section. We all know what you did and why you did it. That’s okay, I’ll deal with it all in good time. Little old lady’s and their cans of WD-40. Yeah right. See you Saturday for dinner. And try not to embarrass me in front of my family! Rocky Raccoon was looking for Gideons Bible! It helped with sweet Rockys revival! Rocky racoon looked like he had found a bottle of gin and had at it. This guy looked dazed and confused. When I looked in on him a half hour later he was asleep! Hey John! Thanks for writing. I think the doctor who fixed my thumb was reeking of gin too. The thumb definitely didn’t turn out the way I thought it was going to. Anyway I hope you’re enjoying your summer. Spoke to J.Kelly on the phone after 30 years. For 2 hours! He’s in Pittsburgh, has 3 sons also. Doing well. Says hello to you and Herm. 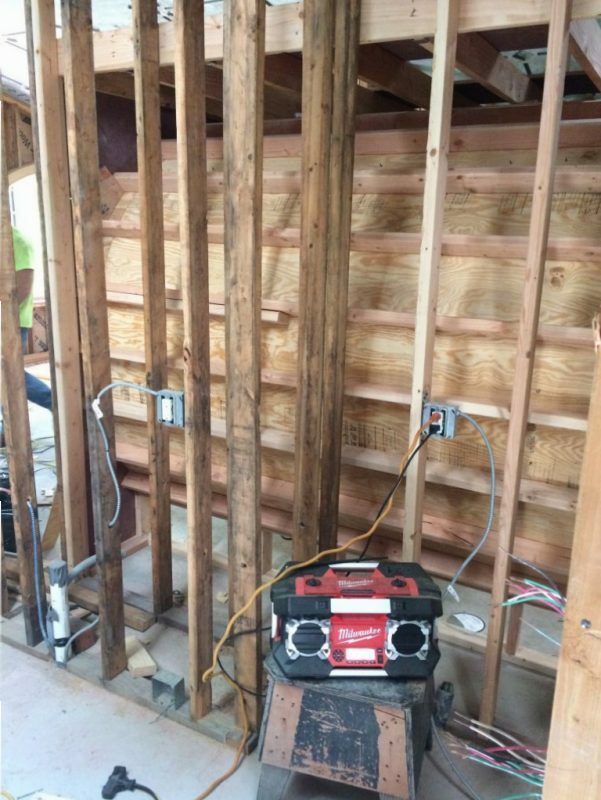 Great to see the progress of the House. Maybe you gotta rent one of dem Port-A-Potty as a Plan B…. Hey Mike! Yeah I get a little lazy about this kind of stuff. I was thinking that things might fix themselves one day. Never seems to happen does it? Had to call my fix it guy. Anyway good hearing from you. Kelly in Pittsburgh. Wow. I wonder how he ended up way the hell out there. the port a potty has merit by the way.